8 people coming to lunch for Christmas Day and no electricity! Adrian diagnosed the fault on the main switch and replaced it in time to get the turkey cooked. Most professional. Diagnosed problem within 5 minutes and fixed it within another 10. This despite the fact that another had been round one hour earlier (Adrian never knew this) and pronounced it was the Energy Companies problem and there was nothing he could do. I called about 15 electricians who all claimed to have 24 hour service at 1am with a burglar alarm that kept going off. Adrian was the only helpful person who brilliantly talked me through how to deactivate it over the phone, then came to our house the next morning to do it more professionally. Then ordered me a replacement battery and was constantly in touch to let me know how he was getting on. Could not recommend more highly! Adrian was fantastically helpful when I found myself at 11.30 on a Saturday night with my smoke alarm going off and not knowing what to do. I phoned him in a panic to ask for help. Adrian got me to take a picture of the alarm so that he could identify the model and then he proceeded to guide me through disconnecting it. He saved me £75 call out charge and with his help I was able to fix the problem in less than 30 minutes and then to get a good night sleep. A big thank you! Adrian was called on Sat evening due to a power failure at myhotel Bloomsbury. I met him directly and explained to him what happened. He knew straight away where the problem was and he worked with my maintanance manager and the power company until we had the power back, around 5am, Sunday morning. He has been absolutely fantastic, very helpful and skillful. I really felt he cared about our issue and i will definetely call him again if needed. Thanks a lot Adrian!! 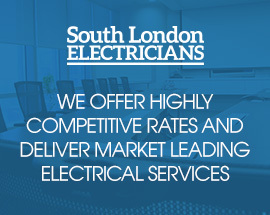 I have worked closely with South London Electricians and find them to be brilliant! Adrian responded quickly to my call and it wasn't long before he isolated the problem with my kitchen wiring and fixed it. Neat job and cleaned up properly. Adrian was highly recommended by a colleague to install some spot lights here in Caterham. Adrian turned up at the appointed time and the work was completed professionally and efficiently. Very neat and tidy, highly recommended. I used this company to totally re-wire my house and found no problems with the quality of their work and also done a lot quicker than other company’s told me it would take. My daughters place is in the progress of having an extension and I will be using them again. I would recommend this company. Goes out of his way is kind hearted willing to please and gets the work done on time. I would recommend this company. Knows exactly what he is doing. I would recommend this company. Very professional helpful price very fair reliable and friendly. He was generally really helpful, he was happy to carry out other jobs as I found them. A really good handyman. I would recommend this company. Good quality workmanship, tidy and quick. My lights stopped working on Saturday afternoon / evening, fixed in one hour. Thankfully Adrian was able to fix the problem quickly and the tenant was very pleased with the work which came in on budget. Friendly, reliable and helpful. Very pleased with all aspects of Mr Thorpe's work. Will certainly use again - and warmly recommend. A great service with a very quick response and a wonderful person, completed the task in excellent conditions. Installed garden lights and fixing simmer switches inside. Fast, efficient, to the point.